As the dreadful summer of hate rolls on, we are feeling a little moribund at Hush-Kit’s deluxe headquarters (situated in a hollowed-out volcano in the Quantocks); in our current mood we were drawn to these World War II posters offering the macabre service of turning bones into bombers and explosives. 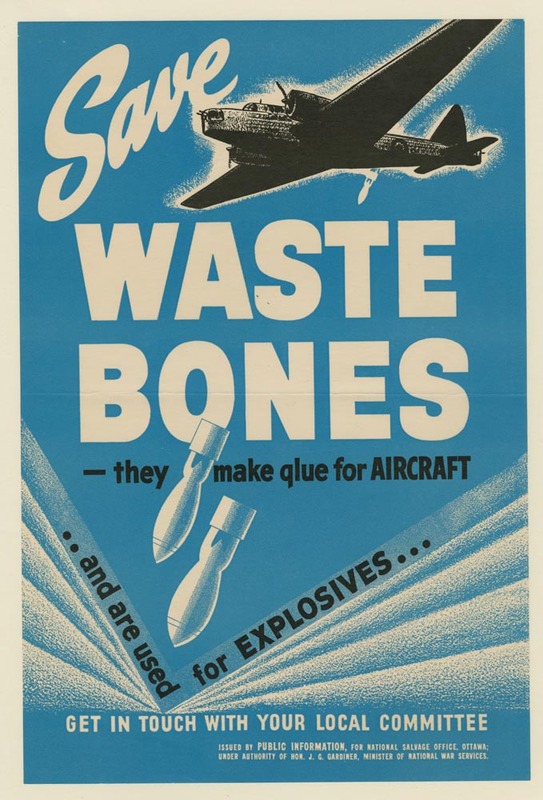 According to the Canadian War Museum “Propaganda constantly encouraged Canadians to reuse and recycle so that salvaged material could be turned into war material, including explosives.” In the top image “they are asked to save leftover cooking bones to be processed into glue for aircraft like the poster’s Wellington bomber.” In the lower image (origin unknown) a Bristol Blenheim encourages citizens to donate their cooking bones to make aircraft glue to make warplanes to divide humans into their constituent parts. Let’s all hope for a more peaceful autumn.